This project is just plain bizarre. 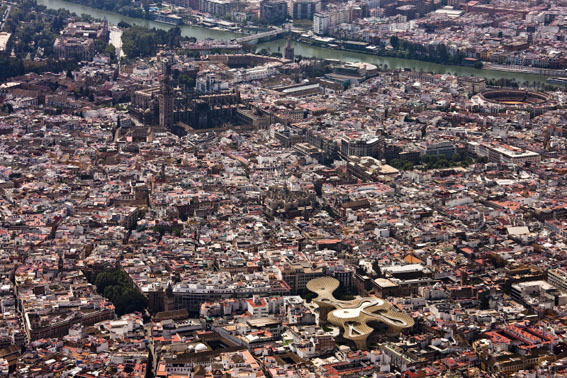 The structure is fascinating yet seemingly clashes with the surrounding historic city. 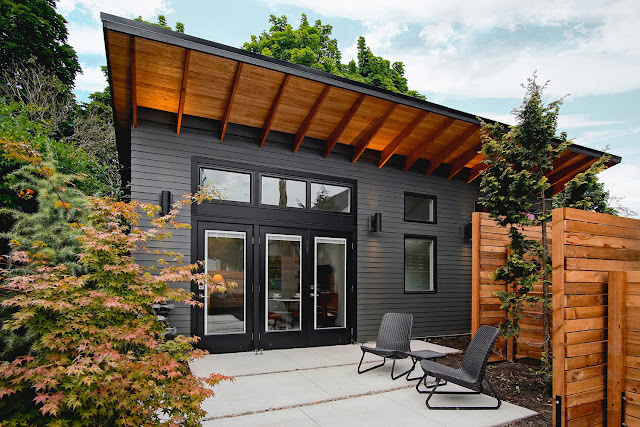 Yet the bold concept and willingness to take risks has paid off in this case. 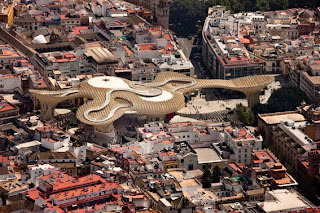 I am fascinated by the undulating form as it billows like a cloud above the urban fabric. 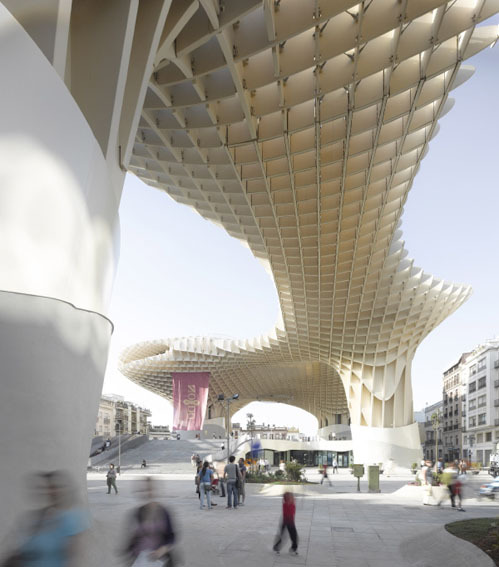 This is architecture that is hard to ignore, that will provoke discussion, that will get people to think about what design means and how it can impact a city. And what more can you ask for? 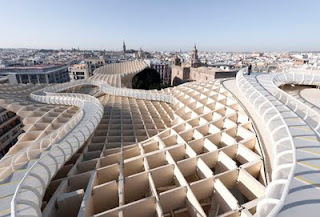 April 2011 marks the completion of "Metropol Parasol", the Redevelopment of the Plaza de la Encarnacíon in Seville. 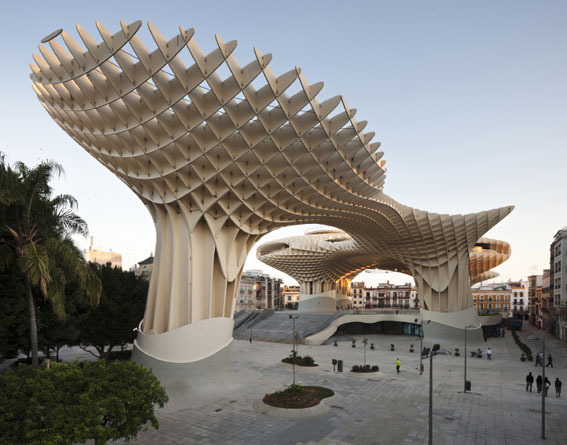 Designed by J. MAYER H. architects, this project has already become the new landmark for Seville, - a place of identification and to articulate Seville's role as one of the world´s most fascinating cultural destinations. 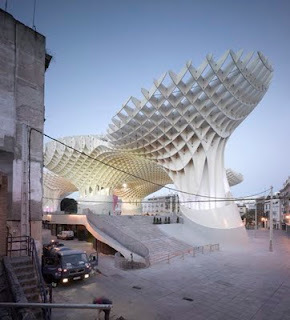 "Metropol Parasol" explores the potential of the Plaza de la Encarnacion to become the new contemporary urban centre. 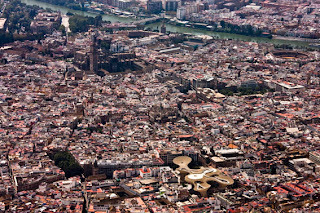 Its role as a unique urban space within the dense fabric of the medieval inner city of Seville allows for a great variety of activities such as memory, leisure and commerce. 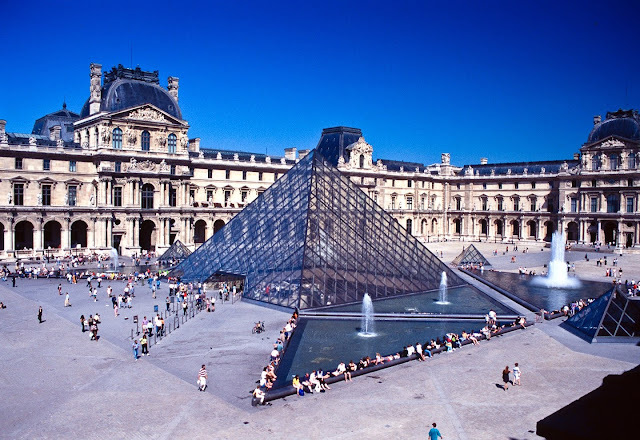 A highly developed infrastructure helps to activate the square, making it an attractive destination for tourists and locals alike. The "Metropol Parasol" scheme with its impressive timber structures offers an archaeological museum, a farmers market, an elevated plaza, multiple bars and restaurants underneath and inside the parasols, as well as a panorama terrace on the very top of the parasols. Realized as one of the largest and most innovative bonded timber-constructions with a polyurethane coating, the parasols grow out of the archaeological excavation site into a contemporary landmark, defining a unique relationship between the historical and the contemporary city. "Metropol Parasols" mix-used character initiates a dynamic development for culture and commerce in the heart of Seville and beyond. Wow Really these parasols are so much beautiful. I wish to have one like that. Do you have any idea from where can i buy it online? Great blog here! 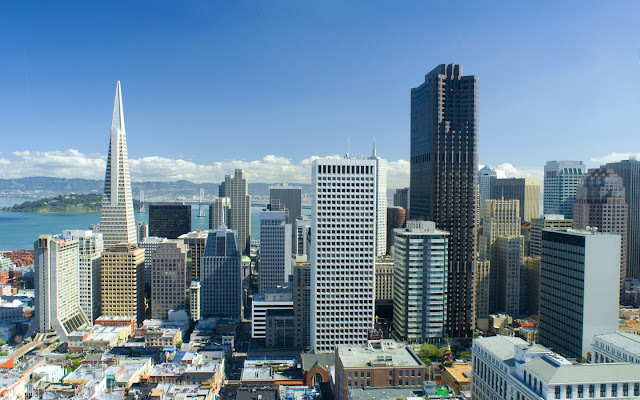 Additionally your site loads up fast! old rehashed information. Fantastic read!